Fans of California art had heard rumors that the fine arts conservator and scholar Maurine St. Gaudens was working on a book about California women artists. Given Maurine’s reputation, it was bound to be big. Now that the four-volume set has been released, though, it’s clear that nothing could have prepared us for this visual thrill ride. Emerging from the Shadows: A Survey of Women Artists Working in California, 1860-1960 introduces 320 mostly-overlooked or forgotten women artists and reanimates them and their work. (Bios of three desert artists are below.) Maurine was not content to render the women as footnotes. Through the generous layouts and a biographer’s empathy, she gives human dimensions to each one. 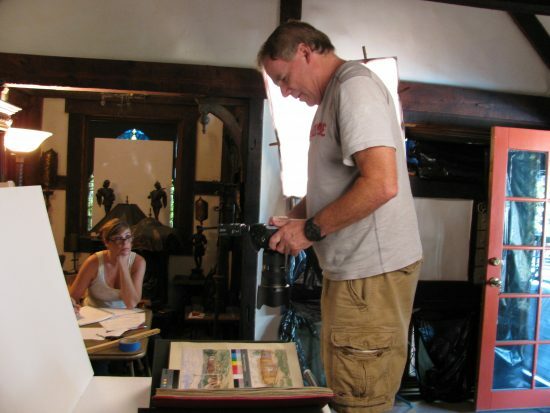 The project started eight years ago with the author’s work as a conservator based in Pasadena. Maurine is the granddaughter of noted San Francisco jeweler Maurice St. Gaudens and the third cousin of the sculptor Augustus Saint-Gaudens. Because she has guest-curated many exhibitions in Southern California–as well as consulting to the estates of artists–people know her and bring her artwork. Over the years, clients brought in paintings and entire collections of work from unrecognized women. Two paintings in particular captivated Maurine: One by Cora Van Epps and another by Paula Zen. Who was Paula Zen? Who were these artists? 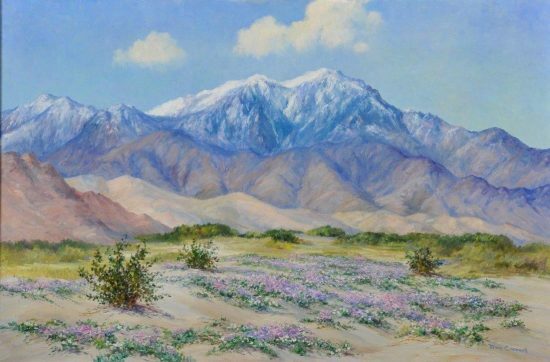 Leta Houston, Sand Verbena Near Indian Wells, Calif. Collection of Valerie Lardner. Photo by Martin Folb, PhD. For answers, the author first turned to An Encyclopedia of Women Artists of the American West, a predecessor volume written by her friends Phil Kovinick and Marian Yoshiki-Kovinick. Along the way she found dedicated allies in Martin A. Folb, PhD, and Joseph Morsman. Joseph is an independent producer who develops content for feature films and documentaries; he previously worked with producers Daniel Melnick and Allen Shapiro. Martin is a research physicist who designs computer systems for clients in the entertainment industry. He’s also a photographer who exhibits widely and has been a consultant to the Eastman Kodak company. This unlikely trio came together perfectly in Maurine’s project. Expanding on the Kovinicks’ work, the team began looking into closets, attics, newspaper archives, basements and diaries. The paintings, prints and sculptures piled up at Maurine’s Pasadena studio, on loan from families and collectors. “I screened over 20,000 images and we shot over 10,000 images to finally decide on the 2,500 we have in the book,” she says. Martin Folb photographing work by Eva Feynes. Maurine’s daughter, Desiree, watches in the background. Meanwhile, Joseph went to work on the bios. “He is an amazing researcher and he went after the data on the artists we had chosen, searching newspapers and archives as I designed the book”. The completed volumes include every style, from realism and surrealism to abstraction; from WPA (Works Progress Administration) artists to Disney studio artists. Some of the women profiled are well-known: Elsie Palmer Payne. E. Charlton Fortune and our own Agnes Pelton. The cover image for Volume Three is Pelton’s Spring Moon–1942, never before published. But the majority of the artists are unknowns. (Maurine explains some of the reasons why in the text). The forgotten artists are so good they elicit gasps as you turn the pages. 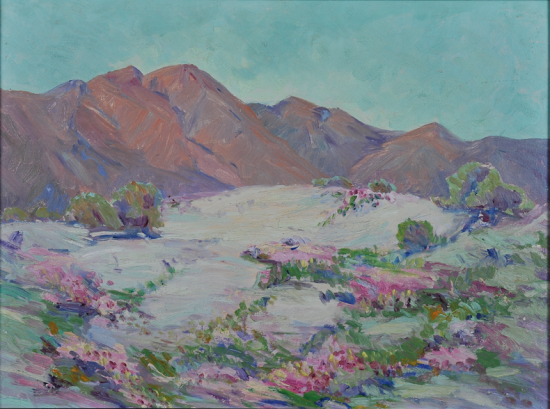 There are women like Julia Gunnison Porter (1867-1952) who studied at L’Academie Julian and at veterinary school to learn how to paint horses in the San Diego backcountry. Or Annie Harmon, who studied with the California landscape master William Keith and painted miniature landscapes on cigar boxes. “Magical little gems,” Maurine calls them. Julia Gunnison Porter, Road Construction in San Diego County. Private Collection. Few of the artists were desert residents, because there were few full-time residents of desert towns like Palm Springs in the early 1900s. Yet many of them made excursions to the deserts; desert scenes are sprinkled throughout the volumes like hidden prizes. Well-represented are women from San Diego–some involved with the Theosophy school at Point Loma–and many of this group, in particular, made treks to the desert. 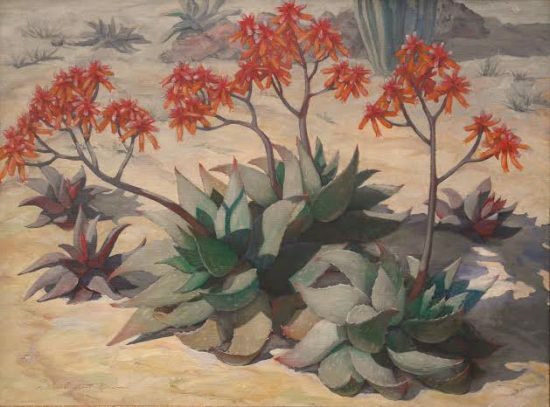 Louise Nimmo, The Aloe Bloom. Courtesy of Edenhurst Gallery. While women artists of the early 1900s were often disparaged as “Sunday painters”, the artists represented are hardly amateur or Victorian. Often, the work is so progressive that the word “modernism” pales. For instance Dorr Bothwell–who lived part-time in Joshua Tree (bio below)–painted futuristic dreamlands. Edna Stoddart, a descendant of Wyatt Earp, painted cubist landscapes full of fantastic birds, witches and cats. Sylvia Fein, Lady Writing a Love Letter in a Landscape, 1954. While Martin, Joseph and Maurine are currently in recovery from their arduous task, their work never really stops. The gaps they found in their research continue to tug at them. Of the two artists who originally inspired the project, they were able to find more on Cora Van Epps but almost nothing on Paula Zen. The dates under her name are blank. On the books’ website, Maurine invites readers to make this an ongoing study and contribute information about the artists profiled, or those as yet undiscovered. To add to the knowledge base or order the books (available from Schiffer publishing, Amazon and the website) see: www.emergingfromtheshadows.com. Maurine St. Gaudens and artist Anya Fisher, 1980. The following biographies of artists who worked in the desert include the surrealist Dorr Bothwell; Martha Thompson Forward, owner of a Palm Springs Inn called The Nooks; and Joane Cromwell. The entries are by Maurine St. Gaudens, from Emerging from the Shadows: A Survey of Women Artists Working in California, 1860-1960. Joane Cromwell was born Catherine Joane Strode on November 22, 1895, in the village of Bernadotte, Illinois, near Lewiston. The daughter of Dr. William Smith and Julie (Brown) Strode, she grew up in Lewistown and graduated with honors from the Art Institute of Chicago in 1916. She married Leslie A. Blakely in 1917. 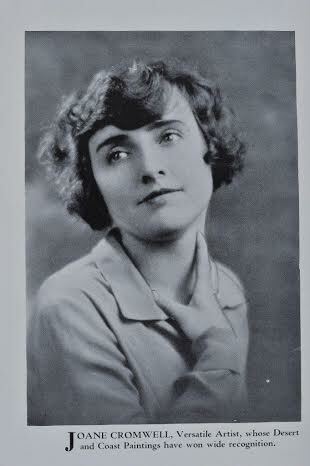 Their son Leslie Cromwell Blakely was born in 1918 while Joane was living with her mother in Southern California; the couple divorced in 1922, and it appears that she divided her time between Illinois and California in those years, as evidenced by the 1920 United States Census where she is listed as a resident of Illinois. By 1922, she was a resident of Laguna Beach. During her early years in California, she exhibited under the name Catherine Strode or Catherine Strode Blakely. After adopting the name Joane Cromwell professionally, she moved to Los Angeles and enrolled at the Otis Art Institute, graduating in 1929. In 1930, she married Joseph W. Skidmore, a partner in Skidmore Brothers real estate development company in Laguna Beach but continued to work under the name Joane Cromwell. In December 1932, she was listed in California Arts & Architecture magazine’s artist directory as a resident of Los Angeles. During her career, she studied with a number of noted artists, including Anna Hills, Edgar A. Payne, George DeMont Otis, and Jack Wilkinson Smith. For a number of years, she also maintained a studio in the desert near Palm Springs. In 1938, Joseph Skimore died; in 1942, she married Andrew Christian, whom she divorced in 1948. 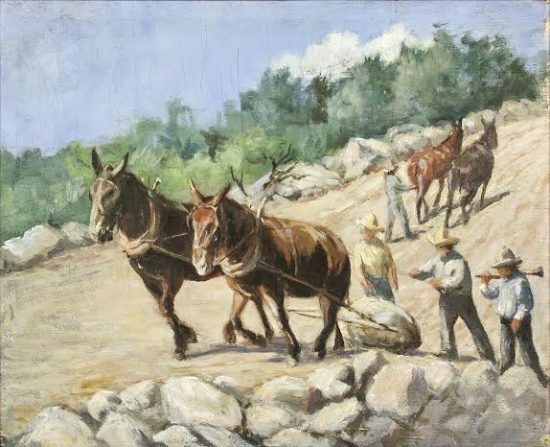 Joane’s early focus was largely on Laguna landscapes. By the late 1920s and early 1930s, she added to her themes, with desert landscapes dominating. Also a muralist, she executed works for the Santa Anita Race Track, Arcadia, California, in 1939, and for the Hollywood Park Race Track, Inglewood, California, in 1942. Joane Cromwell, Untitled desert landscape. Collection of Phil and Marian Kovinick. Photo by Martin Folb, PhD. Joane, who received an honorable mention at an American Institute of Chicago show in 1918, also displayed works at exhibitions, including those of Illinois State Museum, Springfield; Springville Museum of Art, Utah; Laguna Beach Art Association Artists’ Fiesta, Los Angeles; Desert Inn Gallery, Palm Springs; and Artists of Southern California, San Diego. She had a solo show at the La Jolla Art Club, 1942. Her known memberships were in the Laguna Beach Art Association, The Illinois Academy of Fine Arts of Chicago, and the Art Guild of the Fine Arts Society of San Diego. In 1957, she married Morris D. Liddle to whom she was married at the time of her death. Joane Cromwell Liddle passed away on December 23, 1969, in Santa Ana, California. Martha A. Thompson was born on November 21, 1889, in Liberty, Nebraska, the daughter of Robert and Elmira Jane (Custer) Thompson. A complete history of her education is lacking. However, according to the 1910 United States Census, she listed her occupation as a public school teacher in Liberty, Nebraska, which would indicate a certain level of advanced education. As early as 1912 she began spending her summer holidays in California, visiting Los Angeles and traveling throughout the state. By 1918, she was a resident of San Diego. In 1920, she married John F. Forward, Jr., a respected San Diego civic and business leader. Her husband, the son of a former San Diego mayor, would himself serve as the city’s mayor from 1932 to 1934. After the death of her husband in 1938, she divided her time between San Diego, Palm Springs (where she owned a small courtyard inn called “the Nooks”), and Redding, California. A complete history of her art education and studies is also lacking. However, according to various newspaper articles, it was widely reported that she studied under the artist Charles Reiffel as early as 1930 and continued to do so for many years thereafter. Also, according to her obituary, she had been a member of the Fine Arts Society and Art Guild of San Diego for more than forty years. Known exhibitions included those at Von Brieson’s Gallery, San Diego, 1930-1935; New Town Club Gallery, San Diego, 1933; California Pacific International Exposition, San Diego, 1935; and the Los Angeles County Fair, 1936. Martha Thompson Forward passed away on February 7, 1970, in San Diego, California. She is interred at Greenwood Memorial Park in San Diego. Dorris Hodgson Bothwell, known as Dorr, was born in San Francisco, California, on May 3, 1902. The Bothwell family moved to San Diego in 1911, where they became friends and neighbors with the artists Anna and Albert Valentien. Dorr began her art studies with Anna in 1916 at the age of 14. In the early 1920s, Dorr returned to San Francisco to study at the California School of Fine Arts, then studied at the University of Oregon, in Eugene, and the Rudolph Schaeffer School of Design, which was founded in San Francisco, 1926. After receiving a modest inheritance, Dorr traveled to American Samoa in 1928, where she remained for two years and produced many works of art in a wide variety of mediums. Some of these were successfully shown at the Fine Arts Gallery of San Diego and the Beaux Gallery in San Francisco, allowing her to spend time in England, France, and Germany. Returning to San Diego in 1931, Dorr became involved, once more, with the San Diego art community and exhibited with the San Diego Moderns and the San Diego Art Guild, winning the Leisser-Farnham prize in 1932. Also in 1932, she married fellow artist and sculptor Donal Hord. They divorced in 1934 but remained friends. In 1934, Dorr was in Los Angeles; there she joined the postsurrealist circle of Lorser Feitelson and Helen Lundeberg, finding some parallels between their post-surrealist concepts and her own work. She attended classes conducted by Feitelson as part of the Public Works of Art Project (1933–34) and eventually joined the Works Progress Administration’s Federal Art Project as a painter in the mural division. She produced several murals for the WPA in Los Angeles and Riverside, California, and another for a coffee company in San Francisco in 1939. During the same period, she also designed pottery for the Gladding, McBean & Co., Glendale, California. In the 1940s and 50s she taught at the California School of Fine Arts, San Francisco. 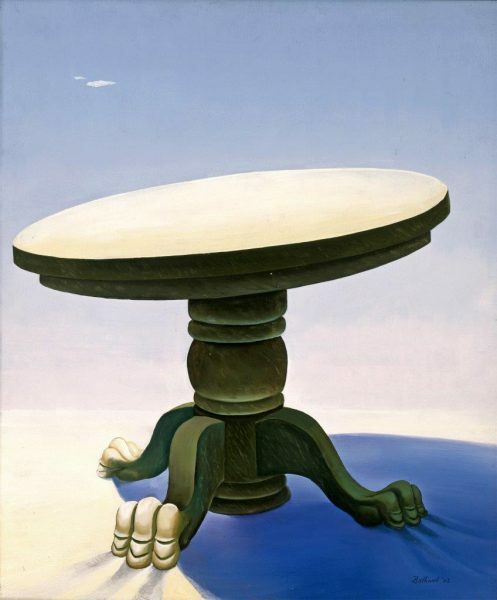 Dorr Bothwell, Table in the Desert, 1942. The Buck Collection. Some of her many exhibitions included San Francisco Art Association 1925–1957; Modern Art Gallery, San Francisco, 1927; San Diego Art Guild, 1927, 1933; San Francisco Women Artists, 1929, 1942; Oakland Art Gallery later Oakland Museum of California), 1932; Golden Gate International Exposition, 1939; Riverside Art Association 1941; California Palace of the Legion of Honor, 1948–1964; and in 1958, a solo exhibition at the M.H. de Young Memorial Museum, San Francisco. Dorr traveled and studied widely in Europe, Africa, and Southeast Asia, and her work is represented in major museums all over the world. 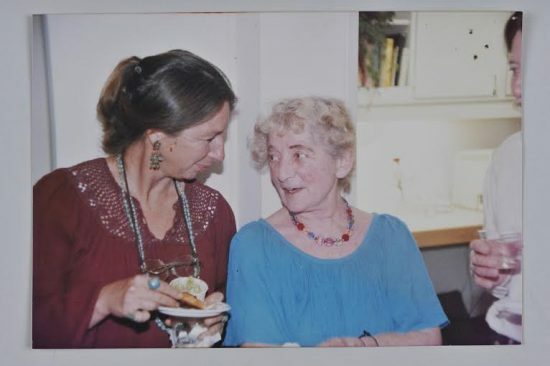 The last years of her life, she lived and continued to teach in Mendocino, California. Dorr Bothwell passed away on September 24, 2000, in California. The Joane Cromwell painting with San Jacinto in the back ground is excellent. An amazing piece of work. Thanks for alerting us to this. 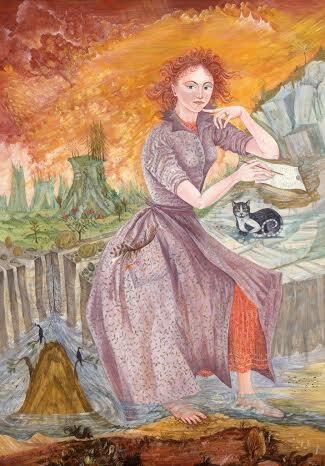 sylvia fein’s 1954, “lady writing a love letter” painting, exquisite….this “mighty fine stuff” i would never be exposed to or hear about if not for your most appreciated california desert artists site, double thank you, dear ann! Another wonderful piece of work thank you Ann. The cover art of Agnes Pelton is beautiful! A veritable treasure trove of research. Fascinating is an understatement. Mary Amanda Lewis did a very interesting desert painting. Ask Art shows it under “Samples” – the last picture on the right. its subtle coloring and beautiful brushstrokes. I looked for the Mary Amanda Lewis desert painting on AskArt.com but couldn’t access it. The artist is included in Maurine St. Gauden’s book, however. Mary A. Lewis (1872-1953) was an early Sacramento artist, one of a small crowd of known Sacramento painters. Her style was influenced by William Merritt Chase when she took an art class from him in Carmel in 1914. Thanks for bringing her to my attention! Thanks Roxie. 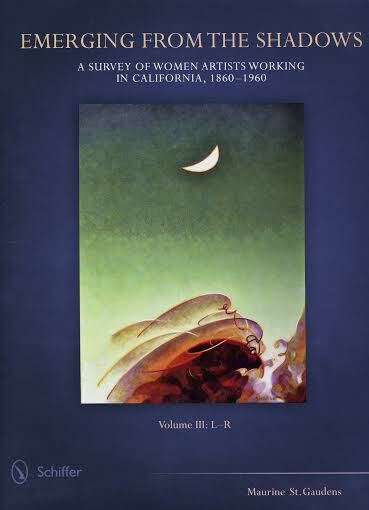 Your own paintings of California fieldworkers share the same spirit of the painters in these volumes.